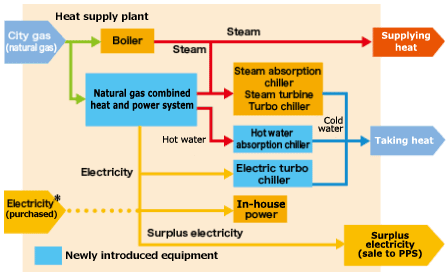 The Tokyo Gas Group operates district heating and cooling services, including small-scale heat supply, in 54 districts. We supply steam and hot and cold water with combined heat and power (CHP) systems* that use natural gas, absorption chillers and boilers. We work on fine-tuning the machines to increase energy efficiency and improve their operational efficiency as well. 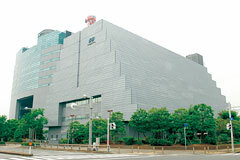 We have updated heat source equipment at the Makuhari District Heating and Cooling Center and converted it into a regional energy center for power generation and heat supply that promotes region-wide reductions of energy use and CO2 emissions, from a conventional district heating and cooling center that supplied only heat. We have optimally mixed the use of the latest highly efficient large-scale CHP system with a total capacity of 15.7 MW, an electric turbo chiller, a boiler and an absorption chiller while also reducing fuel consumption by 19% and CO2 emissions by 19% (fiscal 2015). *Only when the CHP system cannot meet demand. 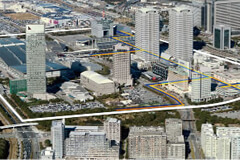 The Makuhari New City area is provided with district air-conditioning and heating services.